Three suborbital rockets are scheduled to launch from the Wallops Flight Facility in the early morning hours of Tuesday, Feb. 24. The rockets may be visible from parts of the east coast. This map shows the visibility regions based on time after launch. Three small rockets carrying a secret project for the U.S. military are scheduled to launch into space before dawn Tuesday (Feb. 24), and late-night skywatchers on the East Coast may be able to see them. As part of an undisclosed project by the Department of Defense (DoD), three Terrier-Oriole suborbital rockets are scheduled to launch from NASA's Wallops Flight Facility in Virginia, between 12:30 a.m. EST (0530 GMT) and 4:30 a.m. EST (0930 GMT) on Tuesday (Feb. 24). 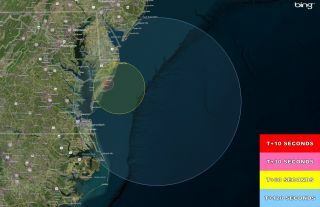 According to a news release from NASA, the rockets will reach altitudes that should make them visible from southern New Jersey down to the north-east corner of North Carolina. All three rockets are scheduled to launch within a one minute window on Tuesday morning. The DoD will not broadcast the launches or provide specific launch times, according to NASA. "At the request of DoD project managers, no real-time launch status updates will be available," NASA said in a statement. "The launches will not be shown live on the Internet nor will launch status updates be provided on social media once the countdown begins. The NASA Visitor Center at Wallops will not be open for viewing the launches." The launches were scheduled to take place on Monday morning, but were delayed due to weather. Terrier-Oriole rockets are frequently used for launching science experiments into suborbital flight (the rockets are not powerful enough to reach orbital altitudes). They can reach altitudes of up to 211 miles (340 km) while carrying payloads of up to 1500 pounds (680 kg).